While I've never had to store this watch up me bum, I've done a lot wearing this watch. Its been dropped, hit, dunked, rained on, lost, found, chewed on (by the dog), peed on (again the dog...) and more recently covered with paint overspary. I think the painting did it in. Automotive paint and solvents aren't so good for rubber. In its final days the rubber became brittle and cracked. Ten years and two batteries later it's finally done in. I bought this watch under supurious circumstances. Me and a friend had a bet on who could find the biggest watch. I lost. But I kept it anyway, and wore it. 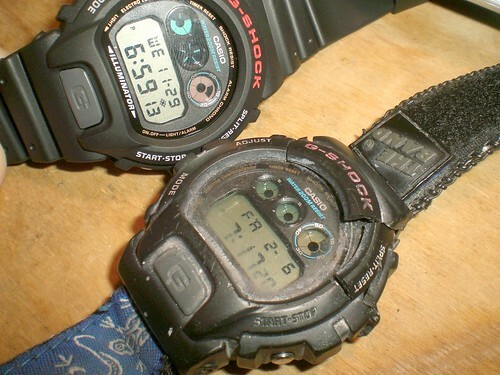 The G-Shock really is incredibly durable even if ugly. With durability and value like that, what else would I replace it with? It took a while to find another one. I don't think Casio makes it anymore. But I located one. This one may last until I retire!